E-Quip Blog: Cold Calling or Offering Value? Cold Calling or Offering Value? Most technical professionals are uncomfortable making cold calls and that's understandable, because we all hate receiving them. Think clients are any different? Cold calls are an unwelcome interruption. 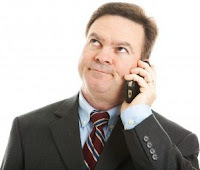 A University of North Carolina study found that 80% of corporate decision makers absolutely will not buy in response to a cold call. Aggravation with telemarketers calling our homes led to passage of the federal Do-Not-Call Improvement Act in 2007. Yet many still advocate cold calling as an effective lead generation tactic for professional services. The respected Wellesley Hills Group conducted a survey that identified cold calling as the second-most productive way, after referrals, to generate new leads. How is this so? They advocate an approach to cold calling that's significantly different from how most sellers do it. Traditional cold calling is a numbers game. Call enough people and a few are likely to buy. It's the classic product push. Without taking time to understand customer needs, the salesperson indiscriminately offers the product or service to whoever is on the call list. Of course, there's a well-rehearsed sales pitch, and usually pressure to make a quick decision. In our business, obviously, we're not trying to make a sale over the phone, only to make an appointment. That doesn't mean the client is any happier to hear from us. Often we're resorting to our own version of the product push—"I'd like to introduce you to our firm." We may know little about the client's needs, which makes the cold call seem similarly indiscriminate. And no request for the client's precious time is insignificant, yet a quick decision to meet with us is expected. Don't call until you've identified an opportunity to help. These days, there's no excuse for calling a prospective client entirely cold. Through your network or the internet, surely you can determine a need or problem where you can offer assistance. This positions you to move beyond the usual product push and to directly address an opportunity to help the client. Offer your entree in exchange for the client's time. What I call your entree is something of value—usually information or advice—that offers a fair return for the client's time. Don't try to schedule a sales call without it! Sure, you can usually get the appointment without an entree. But is the client looking forward to meeting with you? Probably not. A key objective in offering your entree is to create a positive expectation by the client about the upcoming meeting. Trust me, it makes a big difference in how well the meeting goes. A typical entree looks something like this: You read that a municipality is dealing with a serious drainage problem. The most logical solution involves building a retention structure in a popular city park. Yet this option is wildly unpopular with residents, whose understanding of the project has been distorted in part by local news coverage. You call the public works director for that municipality and tell him that your firm worked with another city facing a similar predicament. They employed a creative process for engaging citizens in planning for the project, which ultimately turned most opponents into supporters. This enabled the project to be constructed next to an elementary school playground, saving 40% over the cost of the next most viable alternative. You offer to share how this other municipality successfully dealt with this very similar situation. The public works director enthusiastically indicates his interest, and says that he will be inviting others to that meeting as well. Sound better than the typical introductory sales call? Balance asking questions and offering insight and information. It's easy to overdo it in either direction. Early in the sales process, you lack detailed information about the client and their needs, so the temptation is to ask a lot of questions. That's not value for the client. At the other extreme, you may become so engaged in sharing your entree that you forget to ask questions that illuminate the client's needs. That limits your ability to offer additional help. Best way to balance the two? Plan your sales call in advance. Don't overstay your welcome. To avoid this, I suggest asking for only 20-30 minutes of the client's time. That obviously doesn't give you much time to cover everything you might like to in that first meeting. But usually the meeting will run longer—at the client's request. Here's how it works: When the agreed-upon meeting duration is reached, you say something like, "Well, the 30 minutes I requested is up. I want to respect your time. But if you'd like to discuss this further, I'm happy to, either now or at a later time." In virtually every case I have used this approach, the client has requested that we keep talking, which you would expect if you're providing something of value. Be sure to establish the basis for the next meeting. I'll be honest, offering an entree for every sales call is challenging, and it often gets harder after the first meeting. That's why in planning your sales call you want to identify potential entrees for a subsequent meeting. Then when meeting with the client, you want to mutually determine a reason to meet again. For example, you say: "Let me take a closer look at the two options we discussed and do some preliminary cost estimates. How about we get together in two to three weeks to talk about what I find. Would that work for you?"